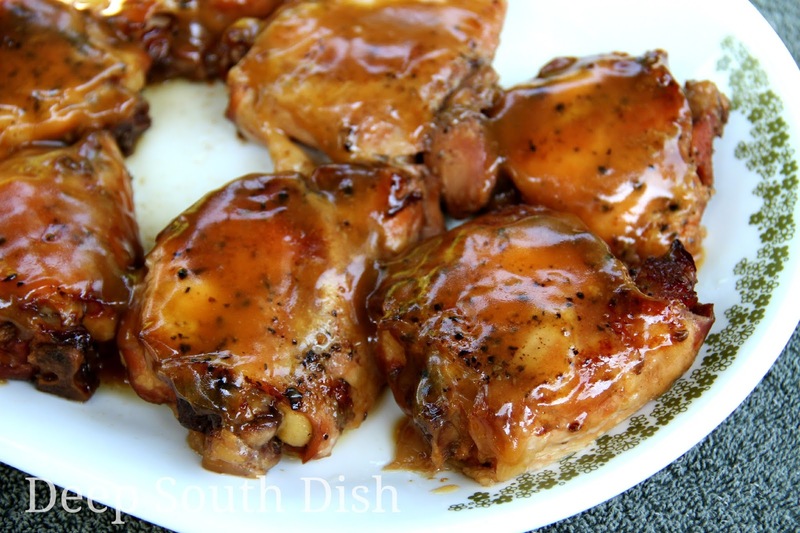 Chicken thighs, simply seasoned and slow cooked in the crockpot with a mixture of pineapple juice, brown sugar and soy sauce, that is thickened and brushed on as a finishing glaze. It's become pretty clear that folks love the combination of savory meats with sweet brown sugar. I've used it to candy bacon, love it for ham, for rubs on ribs and steaks, it's amazing with chicken and I've even used it for fish. Here lately, I've been seeing brown sugar everywhere in these 2, 3 and 4 ingredient dishes you see pass via Facebook and Pinterest. This is another great way to incorporate it in a slow cooker recipe made with three simple ingredients - brown sugar, pineapple juice and soy sauce (I like the low sodium version). Finish it off with salt, pepper and of course, a little Cajun seasoning, and add some of your own favorite seasonings for chicken. When it's done, make a glaze from the drippings, and you've got a simple, easy chicken dish for the crockpot, that I know your family will love. Remove skin from chicken. In my crockpot cooking, I've learned that chicken in the slow cooker tends to generate a lot of fat, so while I didn't always, and I typically don't with stovetop or oven cooking, I usually remove the skin now when the slow cooker is in play. Season the chicken lightly with salt, pepper, Cajun seasoning and garlic powder. Pat seasoning into chicken and place into the slow cooker. I have a variety of premixed seasonings in my pantry so I also added a few grinds of Rachael Ray's Perfect Poultry seasoning to the chicken with this batch. It contains sea salt, black pepper, onion, sage, rosemary and thyme, if you'd like to add a few of those to your chicken too. Whisk together the brown sugar, pineapple juice and soy sauce; pour around chicken. Cover and cook on low for about 5 to 6 hours, depending on the size. Use a wide spatula to remove the chicken from the slow cooker to a platter and loosely tent with aluminum foil; set aside to prepare the glaze, though honestly, this chicken is pretty divine just as it is. To make the glaze, turn the cooker to high until mixture comes to a boil, or for a speedier transition, transfer to a saucepan for the stovetop. I'm not that patient, so that's what I usually do. It's just faster. Whisk together the water and cornstarch until there are no lumps. Slowly stir into the boiling sauce until fully incorporated and continue boiling for about 3 to 4 minutes or until mixture thickens. Remove from heat and let rest a moment. Brush the sauce over each chicken thigh and serve the remaining sauce at the table. Check out more of the slow cooker recipes on Pinterest! Remove skin from chicken and season lightly with the salt, pepper, Cajun seasoning and garlic powder. Pat seasoning into chicken and place into the slow cooker. Whisk together the brown sugar, pineapple juice and soy sauce; pour around chicken. Cover and cook on low for about 5 to 6 hours, depending on the size. Use a wide spatula to remove the chicken from the slow cooker to a platter and loosely tent with aluminum foil; set aside to prepare the glaze. Turn cooker to high until mixture comes to a boil, or transfer to a saucepan for the stovetop. Whisk together the water and cornstarch until there are no lumps. Slowly stir into the boiling sauce until fully incorporated and continue boiling for about 3 to 4 minutes or until mixture thickens. Remove from heat and let rest a moment. Brush the sauce over each chicken thigh and serve the remaining sauce at the table. Cook's Note: I also added a few grinds of Rachael Ray's Perfect Poultry seasoning to the chicken with this batch, which contains sea salt, black pepper, onion, sage, rosemary and thyme. I use low sodium soy sauce so I can control my added salt. 87 HUNGRY PEOPLE COMMENTED. ADD YOURS! I just finished making this. I didn't have a can of pineapple juice but I did have a 8oz can of pineapple tidbits. To substitute for the shortage of pineapple juice. I added a little bit of Martinellis apple juice. Delicious. Hubby loved it. Chicken was falling off the bone. Thanks for sharing this easy delicious meal. Delicious and easy. I added a 8oz can of pineapple tidbits and a little apple juice. Turned out perfect. Family loved it. WOW! Capital letters WOW. Defrosted the chicken after reading this last night, just assembled the whole thing for the crock pot and it smells good from the get-go. Can't wait for dinner. Thanks. Sounds delicious! Would this work as well with chicken breasts? I wrote it for thighs because that's what I use, and favor, for the slow cooker. Chicken breasts cook so fast conventionally that I'm not a big fan of using them in the slow cooker for low and slow extended cooking times. You can certainly adapt this recipe to other cuts of chicken, keeping in mind that cooking times may be affected depending on the cuts used & whether they are bone-in or boneless, so you would have to adapt the time according to the cut you substitute! I didn't test with those so I really can't advise on the times. I find the problem with chicken breast in the slow cooker is it becomes very dry because it is so lean. I've made other dishes using breast and am always disappointed. I would recommend if you are using chicken breast to leave the skin on and the bone in while cooking as that will protect the meat. Thanks for your input Lin - that's been my experience as well. I just haven't had a lot of success with breasts in the crockpot, and especially boneless, skinless breasts. I'm sure that it's because I've always overcooked them, but recipes out there have ranges anywhere from 3 to 6 hours, some on low some on high!! You're welcome Lin! I'm not sure that I can agree with Ina's method of discarding 15 pounds of whole chickens though!! I'm sure it's an amazing stock, but that's a lot of waste & pretty darned expensive stock for us Southerners!! I generally make my stock from things like chicken backs & wing tips that I've saved up in the freezer, or of course when we use a whole chicken to make a stock, we don't cook it quite so long, but we sure use the meat for soup, chicken & dumplings and gumbo down here! I guess it all boils down to the budget & Ina's a bit more wealthy than most of us I reckon. Oh my, when did the Devil start sharing recipes because this looks awesome! 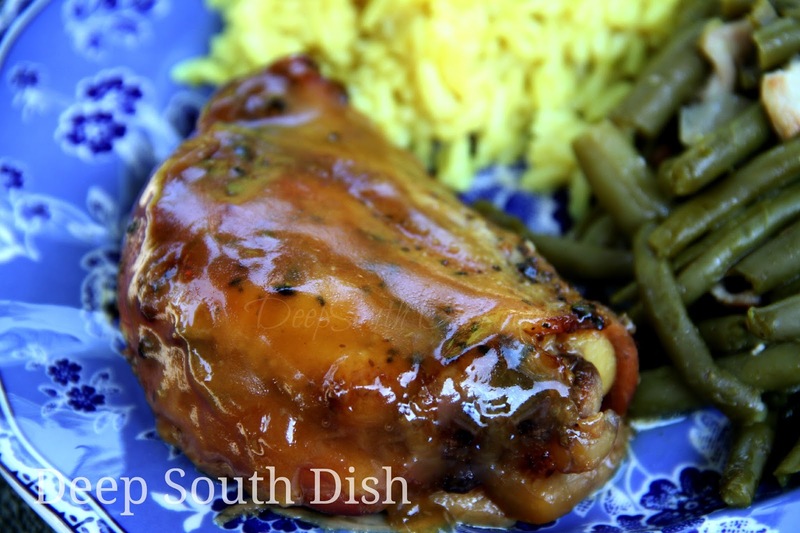 I hadn't heard of brown sugar chicken until just this morning and I have pinned this for trying soon. The older I get the more I enjoy thighs and drumsticks over breasts. Breasts do tend to get dry and I find I like to pound them so they are thinnner and just saute. Thanks for some lovely recipes! LOL! Thank you SuzieQ for the chuckle! Wow this look delectable. Mouth is watering. I love everything about this one, especially the fact I can do it during the day and have it ready when we get home from work. My son is at the 15 y/o growth spurt and practicing football 2 1/2 hours a day...he could eat about all of that and maybe leave a thigh for Alexis and me. I hope they like it Chris! Cannot wait to try this! Our son just finished his senior year of football, goes by much to quickly! I made this dish last night for a family of 4 and it was a major hit so much so my family requested I make it again this weekend. I made a few minor adjustments because of the ingredients I had on hand like fresh pineapple juice, fresh garlic and low sodium soy sauce.This is definitely a new family staple. I'm so happy to hear y'all enjoyed it and thank you so much for taking the time to come back by and let me know!! Is there any way we could cook this on high instead of low to save a little time? My preference for chicken, generally speaking, is low because it cooks through better and stays tender on low where high tends to dry it out. Now... I've not tested this recipe on high, so iI can't speak to the results. I'd say approximately 3 hours or so with bone-in. Boneless thighs are probably gonna shred on you, especially on high. Be sure to check the internal temp before serving though! Sure! I haven't worked the recipe out for the oven yet but here's my best guess. Please let me know if you try it and what your results are! Leave the skin on and sear the chicken in an olive oil/butter combo till browned on both sides. Put in a baking dish, pour over the sauce and bake in a preheated 400 degree oven for I'd say maybe 30 minutes or until an instant read thermometer is at 175 degrees F in the thickest part of the thigh. I'm not certain if I'd want to bake it covered, or uncovered though for the oven. I'm leaning more toward uncovered here. If you use other pieces or boneless chicken, you'll need to make adjustments for time so as not to overcook the chicken. That's what I would do - please keep in mind however that it's my best guess & I have not actually tested this recipe for the oven so please keep us posted if you give it a spin! I have cooked this in the oven many times. I just place it raw in the dish, cover with sauce, and bake at 400* for 30-45 minutes depending on thickness of thighs. Also, I turn them once, halfway through. They are so yummy! Thanks so much! Do you bake yours covered? Or uncovered? How long should I cook in crockpot if I have legs and thighs? I had a few leg quarters that I split. Timing should be roughly the same though it really depends on the size of them. I'd check the internal temperature on both pieces at the earlier time. The problem you may run into is that the legs may be done before the thighs and if you leave the legs in, they could fall apart before the thighs are done. Can I use boneless chicken breast instead? Hi Catherine! You can, and in fact a reader over on my Facebook page did but I'm not sure on the timing adjustment & she didn't respond when I asked. Boneless breasts just cook so fast that I prefer not cooking with them in the slow cooker so I haven't experimented on the time. This looks so good! But why take of the skin? I love the skin LOL Does it get too soggy? Hey Teresa! You don't have to, but there's a lot of fat in thighs anyway and in the crockpot it really creates a whole pond of fat floating on top. I'm kinda sensitive to that and I like the way it cooks with this recipe without the skin. What's a good side dish to go with the chicke?? I would choose a starch and then add a salad or non-starchy vegetable. In the plated picture above, I served it with green beans and yellow rice. Of course! Time should be roughly the same. thanks bought everything last night going to put it in crock pit in 30 mins but for got corn starch can you use flour? Yes. Cornstarch has double the thickening power of flour but just start with the 2 tablespoons and see how you like the thickening before adding more. Just remember you need to blend it together before adding it to the hot liquid or it will get lumpy on you! Wow! Delicious and so easy. Bought skinless thighs (bone-in) and only minor switch of cayenne pepper because I cannot find the Cajun. This will become a staple at our table for sure. Went great with Yams/Sweet potatoes on the side with a little butter and cinnamon. Thanks! Would I cook for the same amount of time if I only do 1 pound of chicken instead of 3 pounds? I would think the time would be roughly the same. Let me clarify, I have cooked them, but they cook fast, and in my opinion, breasts are not particularly ideal for a slow cooker, which is intended to cook food slow over a long period of time. For me, chicken breast is simply much easier to cook on the grill, stovetop or even in the oven. Now... that said, maybe you could clarify what you mean by "if you cook your chicken breast right" and what exactly you do to get a moist & juicy chicken breast in your slow cooker. That would be very helpful and I know not only I would welcome that, but the readers here would love your input on it as well! I actually cook the mixture with boneless thighs cut in pieces. When done, I thicken the sauce and add sesame seeds and add to rice or lo mein with veggies. My family loves it. Easy chinese, and not takeout. Can u do this with a whole chicken cut up. Would time be saMe? I'm so glad to hear that you enjoyed the recipe & thanks so much for letting me know! Hi! I personally can't recommend it because I haven't cooked this recipe from frozen and it also used to be thought of as unsafe to cook frozen foods in a slow cooker. I don't know the most current thinking on that to be honest, so you'd have to research it, but if you did try it, I would suggest that you'd need to add to the cook time to allow for the extra time it will take to go from frozen to thawed. Most important, be extra sure on the internal temperature of the chicken at the end, just to make sure that's it's cooked through to a safe temperature. For thighs that should be at least 175 degrees F.
I really liked this dish. I liked the sweetness of the sauce. My sauce thickened up perfectly. I will be making this again soon. This was well received by my family as well. Thank you so much! Have a great day! You're welcome & so glad to hear your family enjoyed it! Hi! The chicken thighs can be frozen? Nevermind, I see your response to frozen chicken. Thanks! You're welcome Victoria! I know people do it, but it still scares me! This is going on my menu for the week. Looks Amazing. I can't wait to share it with my family. Thank you. I hope y'all enjoy it Liesl! Thank you, Mary! This is a total KEEPER Recipe. It has just a hint of an Asian flavor feel to it. My husband and my kids loved it. I served it with pineapple slices, cooked carrots, brown rice and a big salad. So Good! You're welcome Liesl - glad y'all enjoyed the chicken!! Would like to try this but have a pineapple allergy. Do you have a suggestion for substitute for the pineapple juice? The pineapple juice acts as a tenderizer as well as infusing flavor for this dish, so I think that you could try another acidic juice like orange, with a little lemon or lime mixed in and that would work. Please let me know! The sauce tastes very good. Do you think I could use spare ribs instead? I haven't experimented with that but I'm sure it'd be delicious! For the slow cooker I'd lean more toward using baby backs. Those just do better in a slow cooker in my opinion and they are easier to fit a crockpot, unless the spareribs been trimmed. You could also do the full spareribs in the oven with these flavors though. For the crockpot, follow my instructions on the slow cooker baby back ribs here on the site, and then whether you go with the oven or slow cooker, finish the sauce as above, brushing onto the finished ribs. Let me know if you give it a try!! I had to search my internet history to "re-find" your site, just to comment. Chicken thighs are on sale for $0.88/lb so I ran out and bought some just to make this recipe. It was FABULOUS. Made it exactly as written and instructed except that I had to make my own Cajun seasoning. Excellent recipe that I will make again. Thank you! Love those sales & so glad you enjoyed the recipe! Thanks so much for coming back to let me know - that always means a lot! Oh, I'm so sorry that wasn't clear. The glaze/sauce is the last paragraph of the recipe above, after you remove the chicken and where it reads "Turn cooker to high until mixture comes to a boil, or transfer to a saucepan for the stovetop. Whisk together the water and cornstarch until there are no lumps. Slowly stir into the boiling sauce until fully incorporated and continue boiling for about 3 to 4 minutes or until mixture thickens. Remove from heat and let rest a moment. 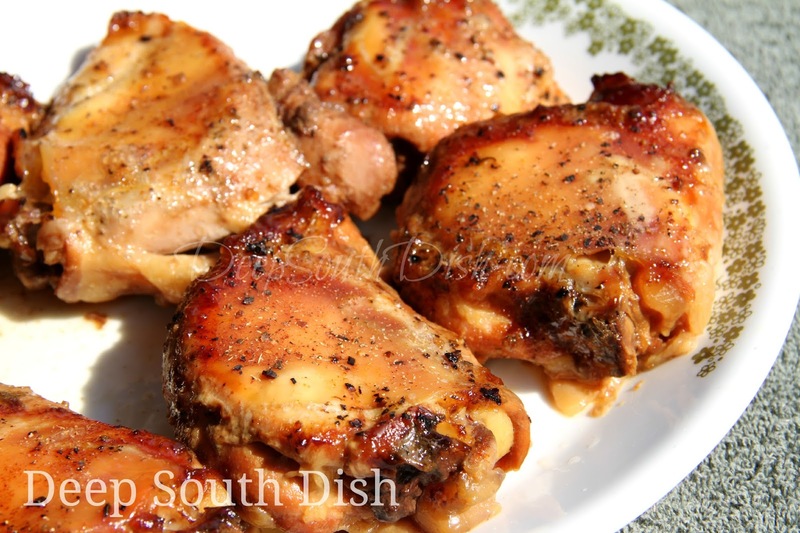 Brush the sauce over each chicken thigh and serve the remaining sauce at the table." Hope that helps! What sides would go with this? Hi Jodie! I would choose a starch and then add a salad or non-starchy vegetable. In the plated picture above the recipe, I served it with green beans and the yellow rice recipe from my cookbook, though any rice side would be good. Roasted potatoes would also be nice. Thanks Debby - glad y'all enjoyed it! There are a couple of ways to search the site but if you're on a smart phone, you'll need to scroll all the way to the bottom and select "view web version." You'll be able to see the full website. There's a search box in the upper right hand sidebar, just type in crockpot or slow cooker. At the top of the page under the header, you'll see "Recipe Index" and if you go there, look for Slow Cooker and Crockpot Recipes. There's also a subject cloud on the left hand sidebar about halfway down the page. Hope that helps! Thanks so much for linking up to Whatcha Crockin' Mary! I don't get out much, so thanks for the opportunity! This was really good. The chicken was fallen off the bone, when it was time to remove them from the sauce. So we just had shredded chicken instead of thighs. I had to add more cornstarch to the recipe. But that was the only thing that I can say bad about it. This is for sure a keeper for this household, thanks for sharing this. Your cooker probably cooked a little hotter than mine or it could have been the size of the thighs. You probably could have pulled them just a tad bit earlier than the suggested time so they weren't shredded, but glad that you enjoyed the recipe! Remember too to use a wide spatula to remove them because regardless, they will be tender! Carrots would be good but I'm afraid the brown sugar would be too much for regular potatoes. I'd prepare those on the side, maybe some roasted potatoes or a simple parslied potatoes. In the picture I served yellow rice and green beans. I am allergic to pineapple. What can I use as a substitute? There is no substitute, since it is there intentionally for the flavor, but you can just use plain water. I'll have to try this one day soon. For years I've been making what I call "Sticky Chicken" which originally is called something I don't remember but it was from a friend in the southern states. I would call it Brown Sugar Chicken because that's about all there is to the recipe. Chicken thighs and legs - skin on. Lots of garlic powder and salt sprinkled on. Place chicken on a foil lined, high sided baking dish (lots of juices). Then take a huge handful of brown sugar and place on top of one piece of chicken. Repeat for each piece. Bake at 375 for about an hour. Do not turn or baste. Honestly, the tastiest, juiciest, crunchiest, unhealthiest chicken on the planet. Ever heard of it? Not that one specifically, but there are loads of recipes for brown sugar chicken as well as a variety of different ones for different sticky chicken recipes. They're all good!